As you exit the airport, go left at the circle to Allister Miller Drive. Follow Heugh Rd for 2.5 km. Follow Victoria Drive for 4.3 km. 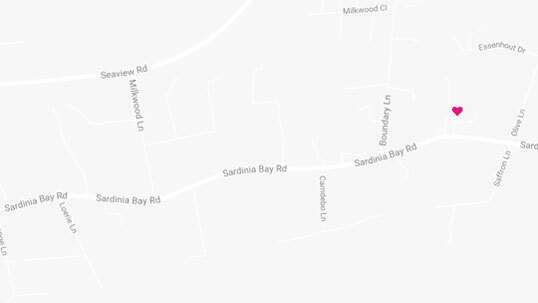 Turn right into Sardinia Bay Rd (Lovemore Park). There is a Go Kart track on your left. Follow Sardinia Bay Rd for 1.6 km. The Plantation is on the right. After 900m you will cross Old Cape Road. Go straight on. Follow William Moffett Expressway for another 1.4 km. There is a Pick 'n Pay Hypermarket on your right with other shops. Go straight on. Follow William Moffett Expressway for another 2.4 km. Cross Main Rd / Springfield Rd. Walmer Park shopping centre is to the left on Main. Go straight on. Follow William Moffett Expressway for another 500m, passing the Moffett on Main Shopping Centre on your left. It crosses the railway line and becomes 17th Ave.
Go a further 650m to Buffelsfontein Rd. Turn Right. There is a Builders Warehouse at the intersection. Follow Buffelsfontein Rd for 4 km to Milkwood Lane. Turn left. Follow Milkwood Lane to the T Junction. Turn left into Sardinia Bay Rd (Lovemore Park). Follow Sardinia Bay Rd for 2.3 km. The Plantation is on the left..
GPS Co-ordinates: S 34 00' 40.00", E 25 32' 21.77"